Meet Spotlyte columnist Cori Zeichner, a 38-year-old mother of two who is married to a dermatologist. As the DermWife™, she shares the skincare secrets she’s learned from living with a top doctor. I remember the first time I saw it. Could it really be true? Did I actually have a wrinkle in my forehead? I felt like a carefree 20-something, but reality was staring me right in the face in the form of a two-inch long horizontal line etched into my face. I love life in my 30s and accept that I am getting older, but why does age have to come with wrinkles? When your husband is top NYC dermatologist Dr. Joshua Zeichner, every day is a free skincare consultation. He has always given me advice during our nine years of marriage, but when I first saw that line, I decided that I had to take it seriously. As a busy mom with two little kids at home, there isn’t much free time for an extensive skincare regimen. My husband gave me the inside scoop with five easy to follow tips to keep my forehead clear, and if I can stick to it, anyone can. Sunscreen is a must. The risk of sun damage is lurking everywhere. I used to think you could only get sun damage from sitting out at the beach, but apparently that is not true. What I have learned is that even low levels of sun exposure really add up. Whether it is a walk in the park or picking up your kids from school, five minutes a day ends up being a lot of sun exposure over a lifetime. Sunscreen works by blocking harmful ultraviolet rays from damaging the skin, which causes brown spots and those dreaded lines. So now, more than anything else, I wear sunscreen every day, no matter if it’s sunny or cloudy. 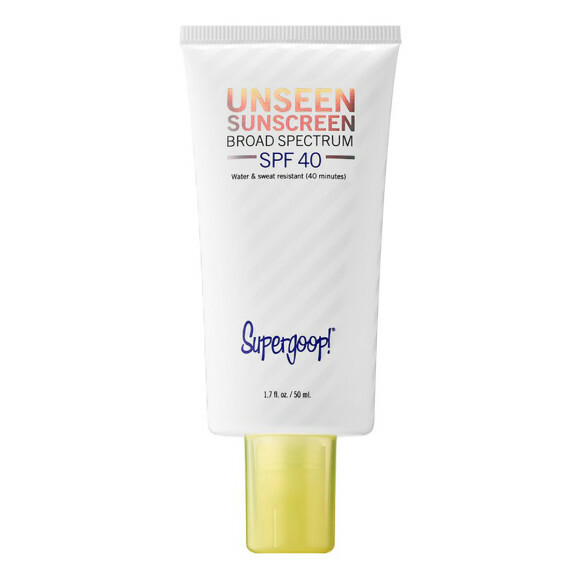 Right now I am loving SUPERGOOP!® Unseen Sunscreen SPF 40, because it is light like a gel and dries velvety like a serum. I have been using retinol at night for almost a decade. According to my husband, retinol is the best-studied ingredient you can get over the counter to keep your skin looking younger, smoother, and brighter. It works by stimulating collagen and elastin, which means strong bouncy skin after use over time. If the skin is strong, it is less likely to develop lines when you smile or frown. Please be advised that women who are pregnant, breastfeeding or planning to become pregnant should not use topical products with retinol unless directed by their physician. I added an antioxidant serum to my regimen in my early 30s. Sunlight exposure, pollution, and cigarette smoke are all harmful to the skin. My husband tells me they cause free radical damage, which is like a tornado, destroying collagen and elastin. Antioxidants like vitamin C scoop up the free radicals and prevent them from causing damage. Vitamin C also helps brighten dark spots and even out skin tone. I layer my vitamin C serum underneath my sunscreen every morning. I am currently using Drunk Elephant® C-Firma Day Serum ($80), which is light, dries without leaving your skin feeling sticky, and doesn’t break me out. In my 20s, my skin was oily, and I never used a moisturizer, but that all changed in my 30s. Little by little my skin began to feel dry and tight and even occasionally flaky. What I have learned is that skin cell turnover starts to slow down after we hit 30, and the skin just cannot protect itself as well as it used to be able to when we were young. Applying a night cream helps keep the skin well hydrated and in good shape while you sleep. That said, it can be hard to find the right night cream. Some are too watery, while others feel heavy on your face. I found the perfect balance in Sisley Paris® Black Rose Skin Infusion cream ($177). Made with all natural ingredients, the rose extract helps plump and improve radiance. Creams and serums only go so far. They can help hydrate and brighten my forehead, but just can’t seem to get rid of that darn line. That’s where the professional prescription treatments come in. Injectable wrinkle reducers at the dermatologist’s office work by preventing your muscles from folding the skin above when you make your facial expressions, both happy ones and angry ones. If you reduce the muscle activity, and the skin isn’t being folded, then the lines become less visible. This treatment is administered by a professional to temporarily smooth the appearance of moderate to severe lines on certain areas of the face — such as my forehead. Like any prescription treatment, it has side effects, so make sure to discuss those with your provider beforehand. Thinking about a consultation? Chat with a trained aesthetic specialist to find providers near you! So there you have it. The five things I’m doing to keep my forehead smooth — DermWife™ tested and dermatologist approved. Want to chat about injectables? Our trained aesthetic specialists are here to help! Get real aesthetic answers, right now from our trained aesthetic specialists! DermWife™ is a trademark of Cori Zeichner.